Switchcars, from developer Altfuture, is roguelike arcade-style action game featuring a fellow who is racing madly across the landscape and trying desperately to reach the year 2055. The only problem? Spacetime is a huge mess, and he keeps leaping between locations and time periods while also being chased by gigantic alien space worms. The game offers more than 1,000 driveable vehicles, with different vehicles becoming available as you enter different time periods (from 1950-2055), but not all of them are suitable in all situations. For instance, you may find yourself hurtling down the tracks in a train when a timeslip sends you onto a highway, which quickly grinds you to a halt. The player must switch between vehicles, including cars, trucks, trains, boats, helicopters, and many others while dealing with oncoming traffic, draining fuel, blown tires, and tuckered out horses, requiring the player to make another quick switch or meet his end. 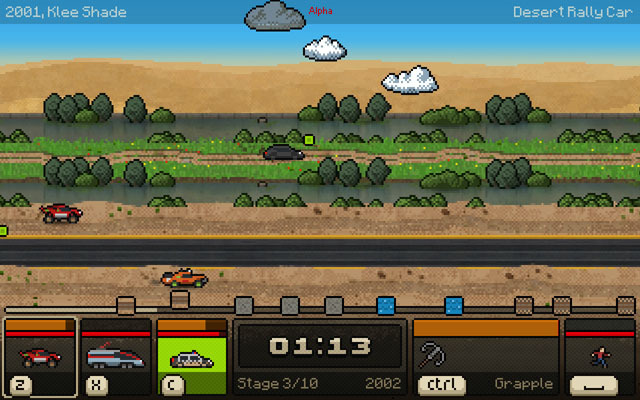 Car switching madness can be had now for PC and Linux via Steam Early Access.